The Nokia XL features a 5″ IPS LCD display of WVGA resolution and it’s bad at all even though we’re used to seeing FullHD resolution on this sort of screen sizes. At €109 it’s a cheap phone to begin with, so we weren’t expecting that much, but the screen’s colors are nice even though contrast isn’t that great. As you’ll see from the live Nokia XL photos below, it gets covered in fingerprint smudges very easily. As far as the Android experience on the Nokia XL, it’s very fluid and smooth. The phone runs a version of Jelly Bean as far as we could tell, but no one specified which one. The 1GHz dual-core Snapdragon S4 chipset does a good job of opening and running apps as well as switching between them. Nokia has also included a bunch of its Lumia apps on the XL including its Store, Camera, Mix Radio and HERE Maps. Microsoft’s presence is also felt with the addition of Skype and OneCloud apps. Speaking of which, XL users will get 10GB of free OneCloud storage as well as 1 month free of Skype Premium. Speaking of goodies, Nokia also includes a 4GB microSD card in the XL’s package. 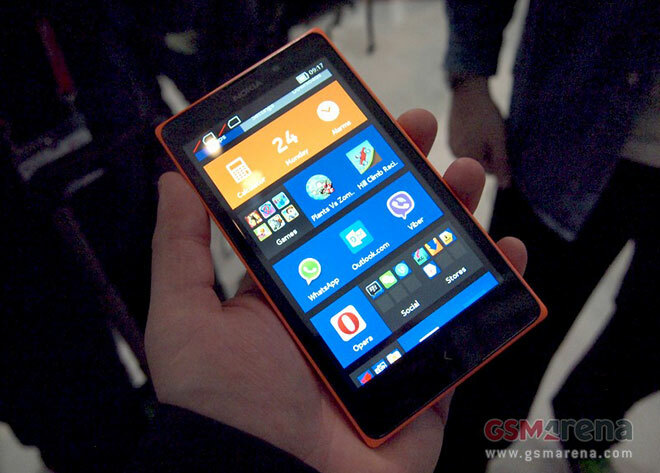 The Nokia XL features a plastic build with an exclusive color, which the X and X+ don’t get – bright orange. It feels very nice to the touch, similar to the Nokia Asha 501 and Lumia 1320. At the back of the phone, there’s a 5MP snapper with LED flash. As you can see from the photos, there’s a large physical key below the display, which acts like a Home/back button. The user interface is overly simple, too, with two main screens – the app list screen and the Fastlane UI. The app list is reminiscent of the home screen of the Windows Phone 8 UI and features app tiles, which can be resized. The larger the tile, the more information it displays. For example, expanding the People’s tile will display your favorite contacts, while the Gallery will display the latest photos you’ve snapped. Check out the Nokia XL in action in our hands-on video below.